I was sitting here earlier today thinking that I didn't have 'finishes' to show you when I remember these little stirrup socks that I knit for my daughter. 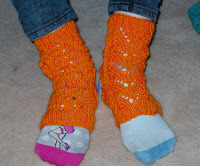 They are from a free pattern on the Lion Brand Yarn Site: Stirrup Socks. The pattern actually calls for stocking knit stitch, but that would get kinda repetative so I pulled out a stitch book and decided to make each sockie different. That really suits my daughter. They take very little yarn and knit up fast. I think a 50gram ball knit both the teal ones. 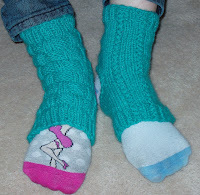 The pattern says to knit them flat, but I did them round so I wouldn't have a seam to finish. I got a good amount of sewing done on the 'Wild Blue Yonder' blocks. All 20 are finished now, and two extra where the background fabric didn't work with the others. I have to admit that I'm pretty happy with them. I was part way through the blocks and was having some trouble getting the edges to line up. Since I had to cut more blocks I got out my Marti Michell Template set A templates 2 and 4 and continued cutting. Yes, it does take a bit more time to cut, but then I know the sizes are closer to perfect and everything lines up nicely and I don't have to spend time trimming points or folding the larger triangle and the rectangles to find the middle points to line them up. The blocks made with the templates turned out much nicer than the first ones, so I trimmed all the points off the already cut pieces and continued sewing. This quilt needs a border. The blocks are 12 inches and I do want it to be bigger. Its not going to make bed size, but large lap is still good. 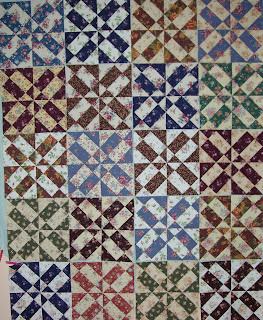 For the first border I want to finish the 1/4 triangle squares and then finish the 8 section pinwheel blocks.It brings the idea of prairie points to mind. Fortunately I cut extras of both units so I am ready to keep sewing tomorrow. 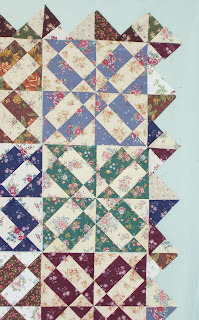 I will use Marti's flying geese rular to cut the missing triangles and then add a matching border all around. Pictures of that next week I hope. I am stuck on how to quilt this thing. I could just stitch in the ditch along all the lines. I would be sturdy, but possibly boring. Any suggestions would be welcome. Have you finished something this week and you want to let the world know. Visit Lit and Laundry and post your link. Those socks look so warm and snug. I'll have to see if I can persuade my mam to get to work. The quilt is just lovely!! Don't you just love Marti's template sets. The templates really do make life easier. As far as the quilting goes, as a long arm quilter, I would most likely suggest and edge to edge design on this quilt. Partly because the fabrics are busy and you most likely will not see any real fancy quilting, such as custom. So with that said, if you are going to quilt it yourself, I would keep it simple. In the ditch would be fine, but why not mark quarter inch lines next to the seams. You will see the quilting and then you don't need to worry about staying in the ditch. Love the socks. I've saved a copy of the pattern to make at some point. I like your variations. The quilt is lovely. Very nice. I bet my ballet daughter would love those socks! Perfect to keep ankles warm and wear over ballet shoes. Yes, that does remind me of prairie points. I think it's a very unique and interesting finish! Heather, those blocks are awesome!! I am wowed! I totally agree with you Jackie. These blocks are very busy. The idea of overall quilting is perfect. I checked the site ThreeUnderTwo suggested (sorry I forget your first name at the moment) and love the designs, but didn't see anything on the first pass through, but will check there again when I have more leisure. I did get the border fabric and its washed and needs abit of pressing and then I cut. can't wait, but first must get the Bernat Knit Along afghan finished so I can enter the associated contest. I never heard of stirrup socks before. good for you for adjusting tha pattern. The quilt top is beautiful!